IEEE 802.11p is an enhancement to the IEEE 802.11 standard for “vehicle to vehicle” and “vehicle to infrastructure” communications, required to support Intelligent Transportation Systems (ITS) applications. Ficosa International’s Advanced Communications Business Unit develops V2X systems with integrated antennas based on fractal technology. 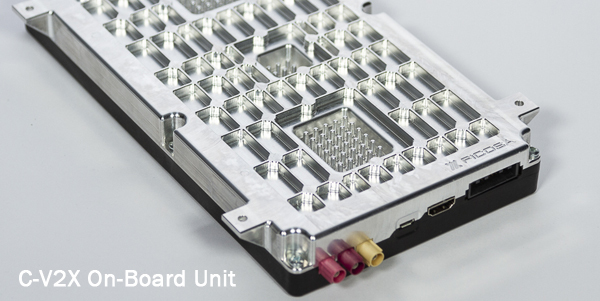 V2X modules allow internal and external communications within the vehicle by integrating various telecommunication technologies, such as V2X communications, CAN bus, WiFi, and positioning systems, in a single unit. Minimum HMI interface is included in the box. An LED bar and a speaker warn the driver of impending dangers. The Ficosa Retrofit V2X Unit (FITAX) is a highly compact and cost-effective design capable of supporting car to car and car to infrastructure communications, WiFi, and location services. Additionally, the FITAX can be expanded with a custom human-machine interface by its WiFi connecting to an APP on a tablet or smartphone. Day one applications tailored to the desired user interface. EEBL – Emergency electronic brake light. AEV – Approaching emergency vehicle. SVA – Stationary vehicle ahead function. GNSS receiver with inertial sensor for dead reckoning, and getting a precise positioning service. CAN 2.0b & Wheel pulse interface. V2X, GNSS, and WiFi integrated antennas. Easy to install in retrofit vehicles. Built-in LED bar and speaker. Same as FITAX0 plus compensated rear antenna.